Fly Casino is thrilled to present the £200,000 Frankie Dettori Sporting Legend cash giveaway March 1 – March 22 2018. If you had played in our massive 250K Age of the Gods promotion last year, then you’ll like this prize giveaway too! It’s a multi-draw promotion that will issue 200K in cash prize awards ranging from £10 to £5,000 without any wagering requirements on prizes won. Best of all, it does not matter if you’re a low bettor or a high roller…everyone has a chance at winning an UNLIMITED amount of cash prizes. With 10,383 chances to win, you’re sure to soar with winnings this March at Fly Casino! Your participation is automatic and free when you play selected games listed within this promotion at Fly Casino. There is no fee or opt-in required. You can join the promotion at any time through your play. Of course, the earlier and often you start playing the better chance you have at winning. For every £10* in total wagers made on the stated slots, you will earn one (1) ticket entry for three weekly drawings. You many earn unlimited tickets and win unlimited prizes. By playing any of these games during the promotional period, you will earn 1 ticket for every *£10 in total wagered. *See currency table under terms for your currency. Frankie Dettori Sporting Legends slot at Fly Casino is an unbelievable new 5-reel, 25-line slot that has arrived just in time for our £200,000 Sporting Legends cash giveaway happening March 1-22, 2018. Play for your chance to win 100% guaranteed jackpots! 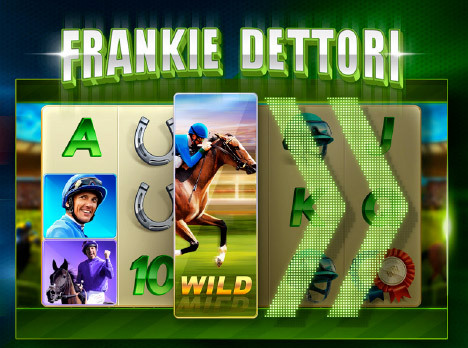 Frankie Dettori Sporting Legends comprises of three jackpots: Daily, Weekly and a Mega Jackpot. What’s great is that the Daily and Weekly jackpots MUST hit by a certain time which is displayed within the game. Of course you are not personally guaranteed to win a jackpot, but you know that you can if you play and that it will happen before the stated time expires! The Mega Jackpot, the largest one, can only be won randomly at any time. When 3 or more ‘Free Games’ scatters appear any position on the reels, the Golden Derby free spins feature is triggered. Three horses (green, red and yellow) will appear for you to choose one of them which awards a multiplier of 3X. The free spins feature ends once a horse reaches the finishing line. If your horse wins each free spin win will have a multiplier of 3x while second and third places have multipliers of 1x to 2x. The galloping wild symbol appears as stacked 3 symbols only on reel 1. Landing this symbol stacked will trigger the Galloping Wild Re-spins feature. With each re-spin the Galloping wild moves one reel to the right as a result the multiplier can shoot up to 2x to 7x! The feature ends when the Galloping wild disappears or if you fail to have a winning combination on the re-spins. Double Up Sunday! On Sunday from 00:00GMT until 23:59 GMT, all members on their first deposit of just $/£/€30 or more will receive a 100% bonus up to $/£/€100. $40’s gets $60 Slots Bonuses! From 00:00GMT until 23:59 GMT, all members on their deposit of $/£/€40 or more will receive a $/£/€60.00 bonus. Claim it 2X! $166.00 BIG TUESDAY! From 00:00GMT until 23:59 GMT, all members on their deposit of $/£/€30 or more will receive a 166% bonus up to $166.00 bonus. Super 110% Thursday! From 00:00GMT until 23:59 GMT, all members are invited to receive a 110% bonus up to 220.00 on your first deposit of $/£/€ 30 or more.